It was the summer of 1992 and I had just graduated high school when my best friend asked me to go to Maine with her. She wanted to visit a guy she liked who had recently moved. I wasn't all that excited about it, to be honest. I knew we would have a great time together, but I was really only going along so she could see her crush. As it turns out, my dad had a business trip planned to Boston for later in the summer, so we all went there for a few days of sight-seeing and Red Sox baseball before my friend and I took the short bus trip up to Portland, Maine. When we got there we met up with her friend who took us to his fraternity house where we would be staying for a few days. It was summer so most of the guys weren't there, and that's probably why my parents let me go!! It was pretty quiet so my friend and I were just sitting out front when all of the sudden this little red car came screaming down the street and into the driveway - windows down, music blaring, and a cute guy driving. I soon found out that his name was Jon and he had a strong Maine accent and used words like "wicked" and "pissah." I was immediately smitten. And get this - not even 24 hours later I told my friend that this guy was the guy I was going to marry. Fast forward almost 24 years and here we are... married almost 13 years with this adorable little five and a half year old who has so much energy, personality, will try anything, and has no fear. And as for my husband, he still has that awesome Maine accent. So it should come as no surprise that my husband loves lobster. I love hearing his stories of having lobster races with his brother when they were kids before his mom would drop the lobsters into a pot of boiling water. Lobster was a part of life, not a luxury purchase, so to this day, he can't believe how expensive lobsters can get down here in PA. He was so used to getting cheap, fresh lobster whenever he wanted. 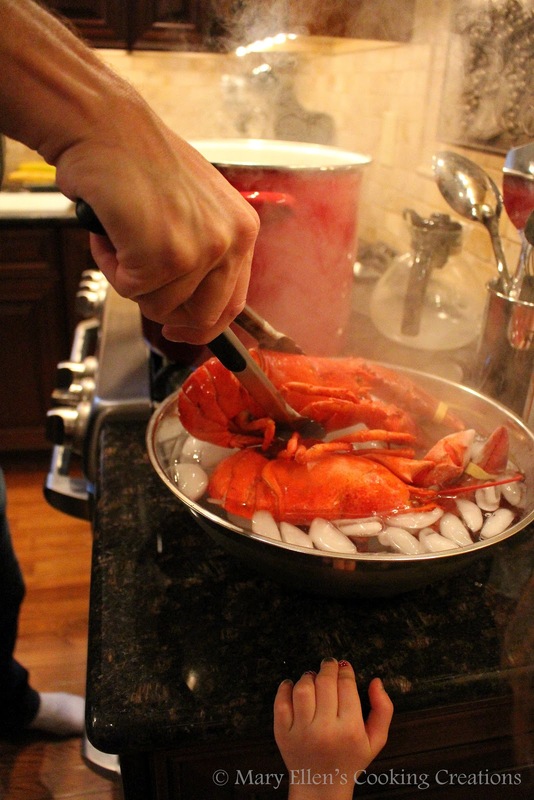 Several times when my father-in-law would come for a visit, he would bring us cooked lobster meat packed in dry ice. We made things like lobster rolls, lobster omelets and pasta with lobster. 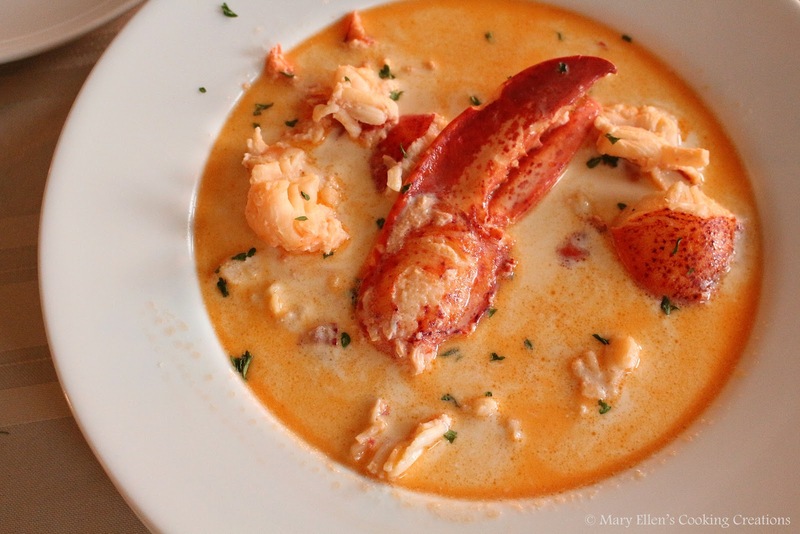 But for years my husband talked about his desire to make lobster stew. One night we were talking about our Christmas dinner menu ideas and he immediately said he wanted to make lobster stew. 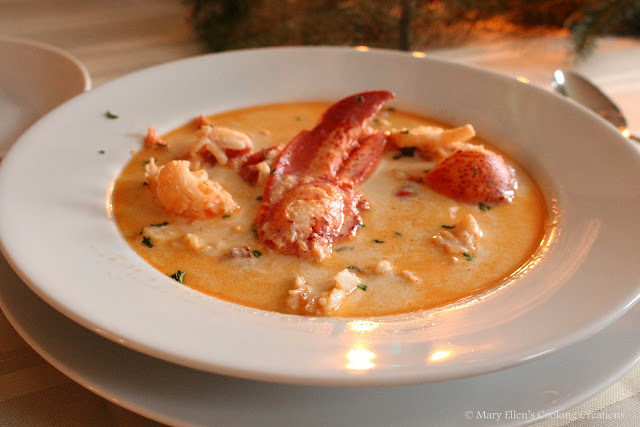 I quickly learned that lobster stew doesn't have any meat or veggies - it is simply lobster meat in a warm cream base. But the way the stew base is created is what makes it so special. The word "stew" in lobster stew is more like a verb than a noun. For weeks he researched recipes, analyzed them, pointed out what he liked and didn't like, until he found the most authentic recipe that reminded him of the lobster stew he used to eat in Maine. 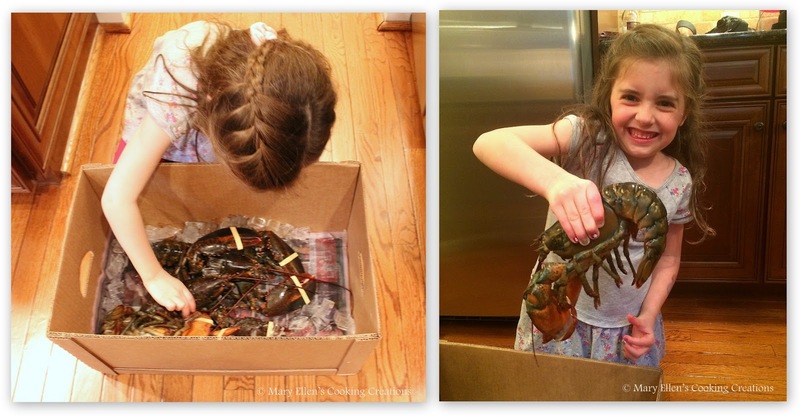 Then came the search for the perfect Maine lobsters. He visited a few seafood stores before deciding on one and placing his order. 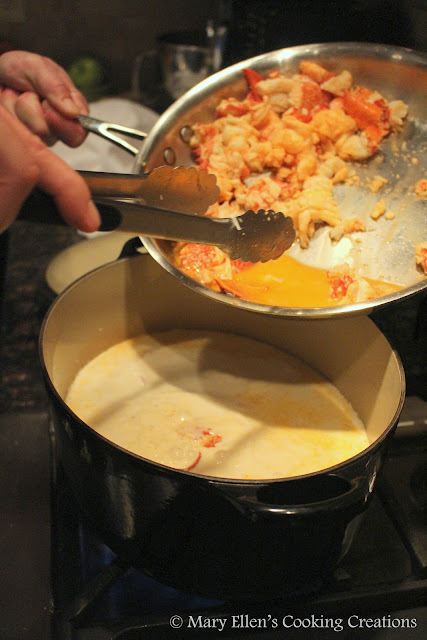 The cooking of this lobster stew became a major spectator event in our house that would last for 2 days. My husband had his game face on and we were all so excited to watch this come together. 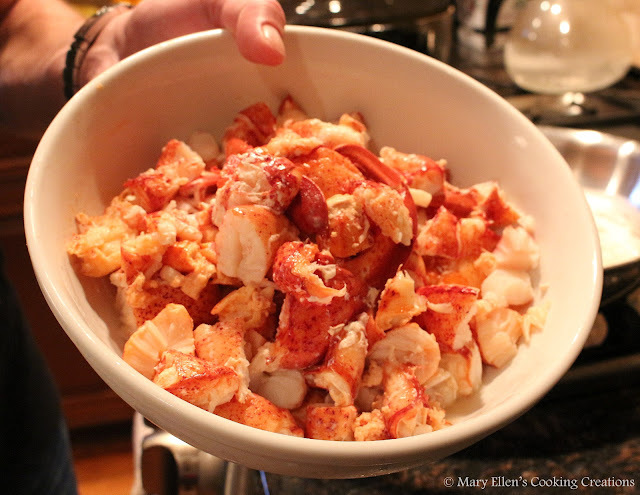 Every step, beginning with my father-in-law walking in with his large lobster pot that traveled all the way from Maine and my husband bringing home the lobsters to watching him ladle the finished product into bowls brought oohs and aahs. And you should have heard everyone when he brought the perfectly plated bowls to the table! There were a lot of steps to making this stew. First he had to cook the lobsters. Once they chilled in ice water, he was able to tear off the tails and claws and then remove all of the meat from the claws and tails. He wants me to note here that a lobster has 2 claws, a crusher claw and a ripper claw. The crusher claw has molar looking teeth and is bigger and more rounded, while the ripper claw is longer and skinnier and has smaller, spiny teeth. He decided to chop the crusher claw meat and leave the ripper claw whole. That's what you see in the picture of the bowl of stew - everyone was able to get a full ripper claw in their stew. So once the meat is removed, he cooked the lobster bodies in butter, sherry, milk, and cream. This would become the base for the stew. This lobster body and milk mixture then sat in the fridge overnight. The next day, he removed the bodies, strained the milk mixture and slowly reheated it. 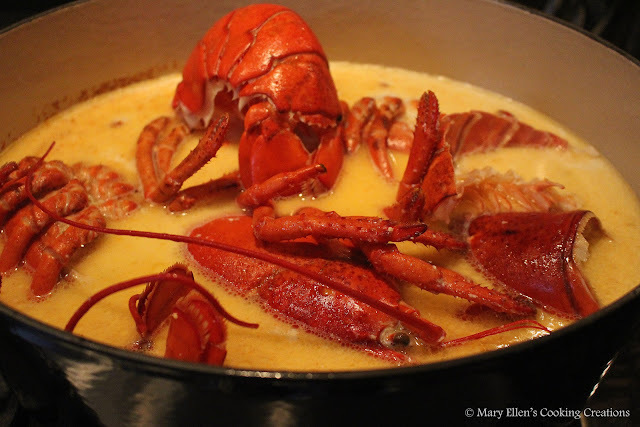 The lobster meat was cooked in butter before adding it to the liquid. After adjusting seasoning and adding lemon juice, the stew was done. He took his time perfectly spooning the stew into our bowls, making sure that everyone had a lot of meat and one full ripper claw. Isn't that an impressive looking bowl of yum??? It was almost too pretty to eat. I couldn't stop taking pictures of it! This was my first experience with lobster stew. 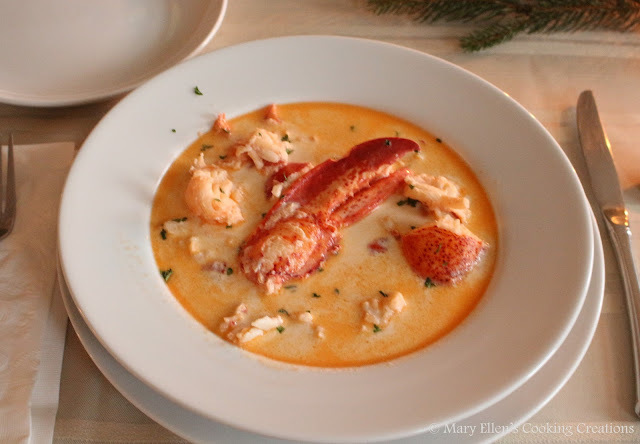 Actually, the only 2 people at the table who had ever had the opportunity to enjoy lobster stew were the 2 Mainers - my husband and father-in-law. Everyone else at the table couldn't stop thanking my husband enough for making this, that is in between "mmmms" and other compliments to the chef, of course. I found the broth to be rich, velvety and savory while sweet from the lobster, with a bit of nutty, almost oakiness from the sherry. This stew really isn't difficult to make - all of the steps are simple. It is time consuming, though, and you need to be patient while removing all of the meat from the lobsters. But other than that, if you follow the steps and take your time, I think that any home cook could master this one. And with Valentine's day falling on a weekend this year, it might just be the perfect time to try it. What's more romantic than lobster? 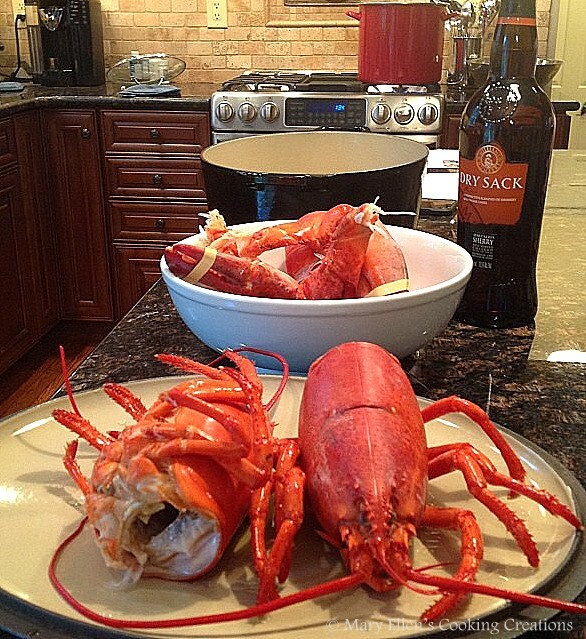 Plunge the lobsters into the boiling water and boil until just cooked through, about 4 minutes. Transfer to a bowl of ice-water to prevent them from cooking any longer, keeping them submerged until completely cool. Drain the lobsters and separate the tails from the bodies, setting the bodies aside. Crack the shells and remove all of the meat from the tails and claws (keep the ripper claw meat whole for beautiful presentation!!). Chop the meat into large chunks (again, except that ripper claw); cover and store in the fridge until day 2. Melt 8 Tbsp butter in a large heavy bottomed pot (he used our Dutch Oven) over medium-high heat. 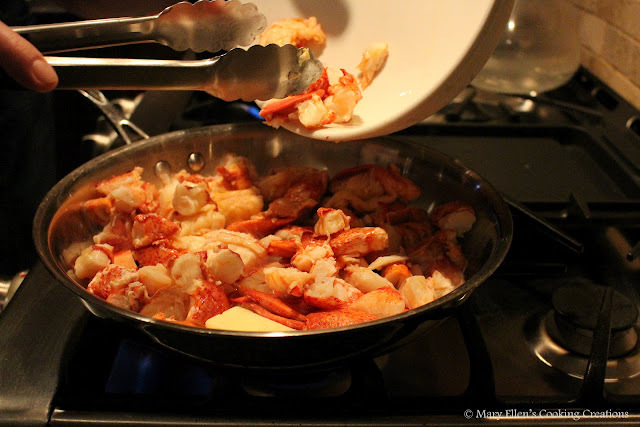 Add the lobster bodies and tail shells and cook, stirring often, until the shells turn a deep red, 5-8 minutes. Add sherry and boil for 2 minutes, and then add the milk and cream and return to a boil. Reduce heat to medium-low and simmer, stirring often, until milk and cream reduce by one-quarter and thickens slightly, 20-25 minutes. Add cayenne, paprika, and season to taste with salt and pepper. Remove pot from the heat and set aside to cool. Once cool, cover and refrigerate overnight. Strain the milk mixture into another medium pot, discarding the bodies and solids, and bring it to a simmer over medium heat. (My husband notes that the next time he makes this he will heat the mixture just a touch before straining in order to soften any of the fats to save them from being discarded). Meanwhile melt 4 Tbsp butter in a large skillet. Add the lobster meat and heat until warmed through, 3-5 minutes, and then transfer the meat to the pot with the milk mixture. Add lemon juice and adjust seasonings. Divide stew between 6 bowls (this made more like 8 servings) and garnish with parsley. We served the stew with homemade no-knead crusty bread which was perfect for sopping up the broth. Our second course was jumbo lump crabcakes with roasted garlic smashed potatoes and roasted asparagus. I am still sad that I missed this event. Great story and beautiful photos! My mouth is watering!! A New Englander drooling over here! YUM! When doing this step "•Meanwhile melt 4 Tbsp butter in a large skillet. Add the lobster meat and heat until warmed through, 3-5 minutes, and then transfer the meat to the pot with the milk mixture." did you also add the 4 Tbsp. of butter in the skillet to the milk mixture or only the lobster meat? Hi! The butter melts and coats the lobster meat, so you put all of it in the milk mixture. Hope you enjoy it! Question, if I want to do this with 2 or 3 lobsters would I need to cut down on the milk and heavy cream? Do you think if I am trying to substitute the dairy bases ( lactose intolerant) would cashew milk or coconut milk be a better sibstitute? Thank you! Hi! I would cut down just a bit. I think coconut milk would add an interesting flavor! Hope you love it!